Fish is an excellent source of omega-3, which helps keep our heart, brain and eyes healthy. However, most people don't eat fish because they don't know how to find good fish at the store and they certainly don't know how to cook it. Purchasing the right kind of fillets is critical to maximize the health benefits that come with consuming these water dwellers as well as eliminating contaminants that come with the territory. Not to mention, we're eager to get rid of that fishy taste that deters most people from enjoying fish. Although farmed fish are readily available they do have PCBs that could be harmful and lead to cancer. If you are buying farmed fish, look for rainbow trout as they have less contaminants. When buying fish, if possible purchase ones that are caught in the wild. Alaskan salmon is one of the healthiest kinds of fish you can buy because of their high sustainability and amount of omega-3. Also worth considering is tilapia. This freshwater fish has grown in popularity over the past few years due to its relatively cheap price tag and low fat percentage. However, the health benefits that come with consumption of tilapia are significantly less than those from eating salmon. If you can't find wild-caught tilapia, purchase ones that are farm raised in America. The fish fillet should have a shiny outer coat and a firm flesh. If it looks dull or mushy, the fish is probably old and shouldn't be purchased. Fish should always be thoroughly refrigerated or on a bed of ice. If the display case smells fishy it probably means they aren't keeping the fish cold enough and you should get seafood somewhere else. Cook fresh fish within two days of purchasing. If you are purchasing frozen fillets, make sure there are no dark spots on the edges or discoloration. Look for packages towards the bottom of the freezer where it is coldest. If you buy frozen, always thaw in the refrigerator before cooking. Thawing fish in warm water or the microwave can ruin the texture and taste. If your fish fillet doesn't come deboned, take clean tweezers to pluck out the tiny bones before cooking. Citrus flavors are great to add a fresh taste to any fish. For salmon, I fill a pan with orange juice (freshly squeezed if possible) just enough to cover the flesh part of the fish (skin side up) for thirty minutes before cooking. That is because fish is very easy to dry out while cooking and this extra boost of liquid will keep it moist. But this doesn't have to be the only way. There are many ways to cook fish including: steaming, grilling, poaching, broiling and baking. 2) using healthy cookware (such as Xtrema Ceramic Cookware). If your fish was farm raised, take off the skin before cooking, otherwise, you can leave the skin on the bottom of the fillet while cooking in the oven and when it is finished the fish should be easy to separate from the skin using a turner. Oven should be heated at 350°F (175°F) and, depending on the type of fish, take around 10 minutes to cook. When the fish is done, the flesh should no longer look translucent and it should flake easily. For salmon, an additional sign that the fish is cooked is the white fat that appears on top. 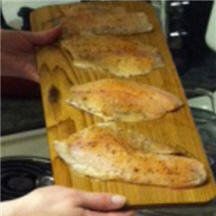 Here is a family recipe for a quick rub on the fish before cooking: Spice Rub for Fish. Article and Photograph Copyright 2013 Alicia Lawrence. Alicia Lawrence is a freelance writer who, in her free time, enjoys creating tasty meals for friends and family. Used with permission.